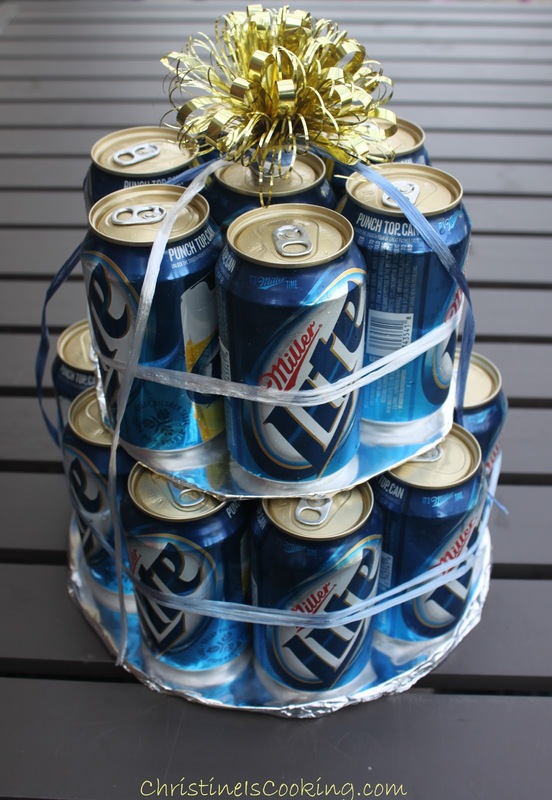 A Beer Can Cake is a fun adult party gift for your beer lovin' friends. You can make it as simple or intricate as you desire or as small or tall as you like. 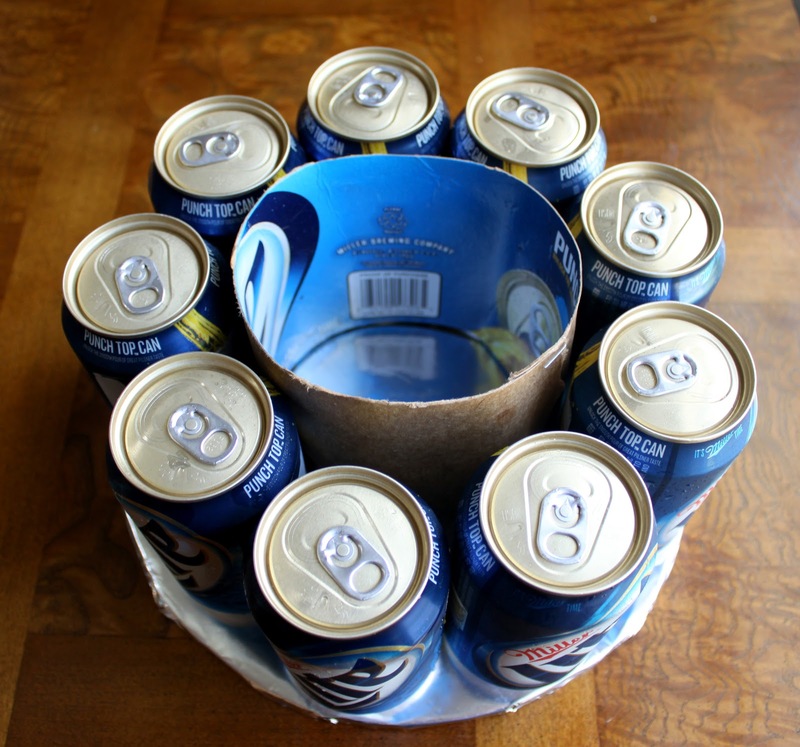 Here are basic instructions for making a beer can cake. This project took me less than 30 minutes from start to finish. It was fun to make! 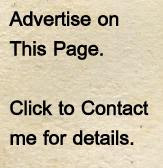 (1) Buy cans of your beer of choice. The amount of beer you will need will depend on how large your cake layers will be and how many layers you want to have. For the cake pictured above (2 layers) I used 16 beer cans. (2) Find what you will use for the base of your cake layers. It has to be flat and sturdy. You can buy cake rounds from the craft store or cut your own from thick cardboard. For the bottom, I used a dinner plate to trace and cut out circle cake rounds from cardboard. I used 2 cardboard pieces held together with double stick tape to provide extra support for the bottom. For the top layer, I used a small plate to trace. After you have your layer supports, you can cover them in aluminum foil or wrapping paper to decorate them. Secure the foil or paper with tape on the bottom. (3) Assemble the beers on the bottom layer. Place beer cans on the outside of the layer. You can either fill the middle in with more beer or keep it empty. If your going to be transporting the beer can cake, you should add a carboard support. The thin cardboard from the side of a case of beer makes an excellent support. Just cut it to size, give it a few staples and insert it behind the beer cans. (4) Assemble the middle and/or top layer. (5) Secure and decorate the layers with ribbon. Decorate your beer can cake with bows, candles, goodies etc. Great! I'm going to make one this weekend camping on hubby's birthday! Thank you for the instructions.